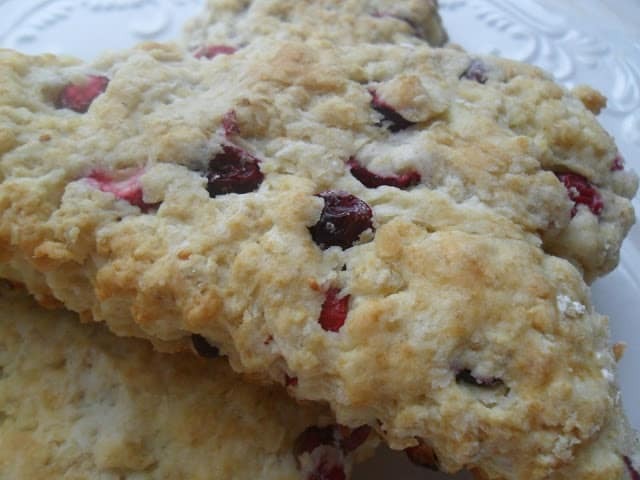 Get into the holiday spirit early this year and make these delicious scones. 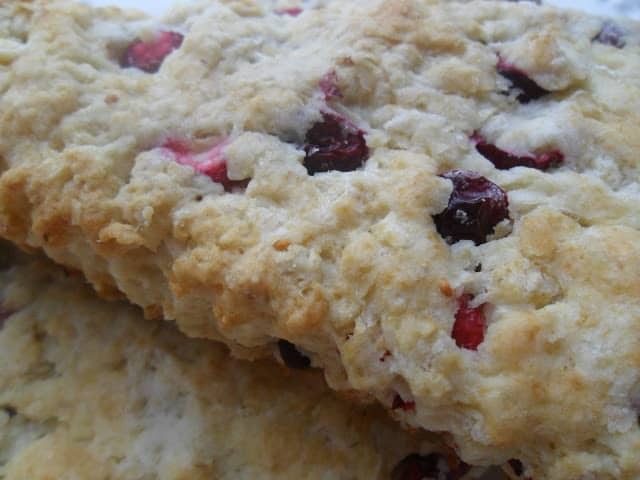 Cranberry Oatmeal Sourdough Scones are dotted with a fall favorite ingredient; cranberries. Cranberry and orange is a classic flavor combination. The two ingredients compliment each other beautifully. Top the scones with a light drizzle of orange powdered sugar glaze. The glaze adds just the right amount of sweetness. We love cranberries here at Turnips 2 Tangerines and have several recipes containing both the fresh and dried varieties. When cranberries are in season, buy a few extra bags of cranberries to freeze. Simply throw them in the freezer in the same bag they came in. When the urge strikes, you’ll have extra cranberries on hand. Bags of cranberries are relatively inexpensive so stock up!! Cranberry Season in Wisconsin is marked with festivals, parades and recipe contests. Wisconsin is one of the leading producers of this little bouncy berry and we are very proud of that fact. There are cranberry bogs sprinkled throughout Wisconsin. If you’re ever visiting Wisconsin in the fall, which is when we harvest cranberries, stop by a cranberry bog and take a tour. You’ll be fascinated. Preheat oven to 425º Line baking sheet with parchment paper. In large bowl combine flour, oats, sugar, baking powder, salt and baking soda. With pastry blender cut in butter until mixture resembles coarse crumbs. In small bowl combine egg, apple juice, yogurt, orange juice and orange zest. Add egg mixture, sourdough starter and chopped cranberries to flour mixture. Mix lightly. Turn out dough onto a well floured surface. Knead 8 to 10 times. Pat dough into a 8 to 10 inch circle. Cut into 8 wedges. Place on parchment lined baking sheet. Bake for 12 to 15 minutes. Transfer to a wire rack. Make Orange Glaze: Stir together confectioners' sugar and orange juice until desired consistency. Ocean Spray is one of the leading producers of cranberry products. Do you like blueberries? Do you like lemons? How about scones, you like scones too? Then you are going to flip for over these sensational scones because they have all three Fresh Blueberry Lemon Scones. YUM! These scones look so amazing!! I'm loving all these sourdough scones you posted! !